Monday, May 19th to Sunday, May 25th – Sea Bass – New 15 Fish Limit – Still 12.5 Inches – 6 AM to 3:30 PM Long Trips - $125.00 – You Know We're Going To Count & Measure. Still 8,700 "Oyster Castle" reef blocks by the rail – 2,524 at Jimmy's Reef – 1,746 at Ake's – 360 at Lindsey Power's..
Back & legs sore from driving an 8 pound grinder; Mike & I have been using 16 grit disks on the deck. Soon have a fresh coat of non-skid on for the season. Dredging's going great too I'm told. Need plenty of water under the keel. With many more boat projects to come, Coast Guard inspection, and Reef Foundation duties; I've been busier–still trying to get our sea bass fishery resolved. Even went to DC and was welcomed, really welcomed, by Senator Mikulski, Senator Cardin & Congressman Harris's Staffers – even met with Senator Cardin himself for a few minutes.. I also had opportunity to meet with other Maryland Representatives' staff. What an amazingly busy place, with truly sharp & dedicated people. Beyond the bluster of day to day politics lies a world of brilliant staffers who's job it is to accomplish their boss's goals and relate constituents' concerns. In the next election they may have a new boss – but for many this is their career. All these folks were surprised to see pictures of corals growing off our coast. I left 8 x 10s with them. . . But I don't think they were surprised at our troubles with MRIP catch estimates. Below is the piece I wrote for Staffers to try and explain how bad-estimates are undoing the public's trust in fishery management; the piece I wrote to try and explain my deep dissatisfaction with catch estimates' influence on regulation. Feel free to share it with your DC Senators & Representatives' Staff too. We are ignorant of so much in the ocean, even our corals evade science's sight. These catch estimates are the poorest imitation of science, yet their inaccuracies are presented by regulators as gospel. Instead of honing & refining regulation, catch estimates amplify management's ignorance. Among tasks at hand, getting the sea bass fishery out from under catch-estimate's ax and pushing for MRIP's repair are perhaps first. Then, with help from wind energy I think, we can turn the ocean blue again..
At the very least, I will not have surrendered. Grab a beverage and read this piece. Send it off too. We have more say in Government than a simple vote – Write. Sometimes they read. This Email Is Shorter Than It Looks! Lots of Catch-Estimate Tables; Swiftly Taken-In Tables..
primarily from enormous spikes found in MRFSS/MRIP catch-estimates, spikes in catch that exist only on a computer screen..
MRFSS: Marine Recreational Fishing Statistics Survey. Dates: 1980 to 2012. MRIP: Marine Recreational Information Program. (the Congressionally mandated repair to MRFSS) Dates: 2012 until truly repaired..
"Wave" is a two month estimating period. For instance, March/April = Wave 2, and May/June = Wave 3..
"Mode" is a description of who is being estimated – For-Hire (party & charter boats) or Private Boat (recreational fishers) in this work. "PSE" is a statistical term describing an important aspect of confidence. - Managers, however, do not use PSE spreads, at all; even though they may be huge. -Management, to streamline process, uses only an estimate's centerpoint. An estimate is said to be "inaccurate" if it could be more than 100% off from the 95% confidence level which is statistically expressed as a PSE greater than 50. With the permission & blessing of the Nichols Family, I began Self- regulation on sea bass & tautog in 1992 aboard the party boat O.C. Princess, Ocean City, MD. "All sea bass have spawned by 9 inches, some twice." Within months I knew regulation was going to work, that we could undo the damage done by industrial overfishing. Sea bass fishing became better - Instantly. 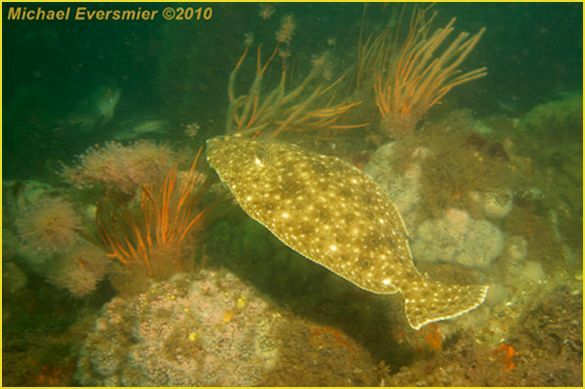 By August, 1992, we could see healed hook wounds from Kahle hooks in numerous sea bass from nearshore reefs, especially reefs less-known or unknown to others. 2) 1997: Published too late in the Federal Register for '96, management is actually begun in '97 with a 9 inch limit. Listed as a goal is increasing the size limit to 10 inches. 3) 1998, Size limit up 1 inch for a 10 inch size limit, plus a late-summer closure because an increase of 1,220,000 fish is estimated in New Jersey's 1997 For-Hire estimate. This takes the New Jersey For-Hire Estimate to 3,100,000 sea bass. No other state or mode varies from previous years by a noticeable amount. It's Extremely Important To Consider & Remember The Assertion That JUST New Jersey For-Hire Caught Three Million Sea Bass In 1997. The Recreational Total That Year Was 4,721,000 Cbass Caught. This Estimate Is, Of Course, Junk. I argued against it and especially the August closure, yet failed to gain traction. I was told, in the Federal Register, to take my clients striped bass fishing – quite impossible along the coast in high-summer.. 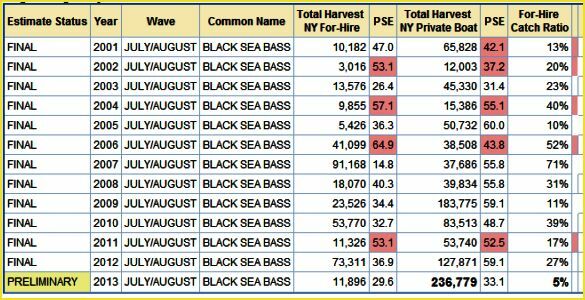 While exact numbers in the estimates are nearly worthless; we did, however, catch a lot of sea bass back then; just one year into management; just one year after wholly-unregulated sea bass fishing had ended. 4) 2001, Size increase to 11 inches and a spring closure. Regulation in this early period tightened when New Jersey's Y2K For-Hire estimate Alone & Again put coastwide recreational fishers over-quota. 5) 2003, increase to 12 inches with a short fall closure. For once, New Jersey actually declines slightly in 2002 while Delaware increase from about 110,000 in 2001 to 560,000 sea bass in 2002.. MD's up 200,000 year over year from '01 to '02.. In the estimate MD For-Hire 'catches' 311,000 sea bass, but I'm absolutely positive this number is at least 100,000 too high. Fishing was awesome. 6) 2009 – Size limit increased to 12.5 inches, but I don't remember exactly why and can't find it. 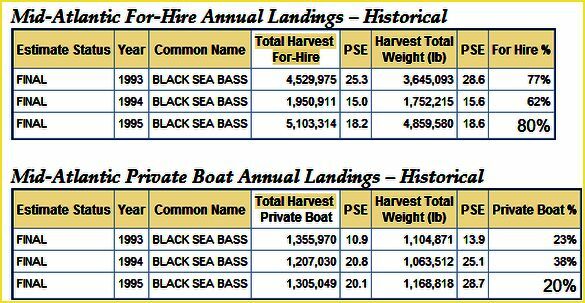 Note: 2008 is the first year Private Boats are estimated to have caught more sea bass than the For-Hire fleet in the Mid-Atlantic with 63% of total landings. A Tumultuous Year; in early fall, 2009, an Emergency 180 Day Closure is declared based on estimated 2009 coastwide landings of 1,769,000 sea bass, or about half what the New Jersey For-Hire fleet alone had been catching previously. Estimates credit Private Boats with another percentage of the fishery increase in 2009, catching 74% of the coast's sea bass. This is several times the percentage of the fishery they'd held earlier, and a much greater percentage of the fishery than professional skippers believe Private Boats capture. 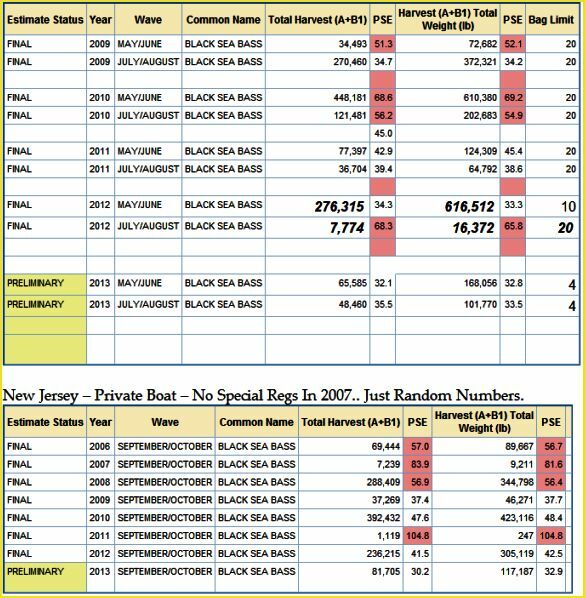 New Jersey's private boats were up 145,000 in wave 3 plus another 220,000 pounds in wave 4.. Even allowing a million fish here and there, the downward catch trend from regulatory tightening is plainly seen in party/charter estimates. For-Hire catch is factually reduced when regulations tighten; Regulation's Effect Is Real. Catch on the private boat side, however, is reported by the estimates to erupt wildly & uncontrollably, then subside swiftly. There is no apparent regulatory control over the Private Boat mode. That, of course, is not at all true. Private Boat Catch Is Increasingly Restricted, it's just not seen in the estimates. The regulatory history is driven by estimate spikes. Only rarely are broader multi-state/multi-mode/multi-wave increases a factor. In the early years, estimate spikes were seen primarily on the For-Hire side. Now it's virtually always on the Private Boat side, and never both. Catch increases are rarely seen across time, across recreational sectors & across state lines as in real life. Estimate spikes never resemble real biological fish production. In the estimates, fishing doesn't get better over time, it's all of a sudden. 'Statistically' these catch increases happen swiftly, inside a two month period, and then melt away..
8) In 2010 we had a "gunshot start" for the first time ever; a race-like opening for sea bass in late May because of the 2009 emergency closure. The season closed October 5th. In the lower Mid-Atlantic there was a four month open season with a 12.5 inch size limit and 25 fish bag. 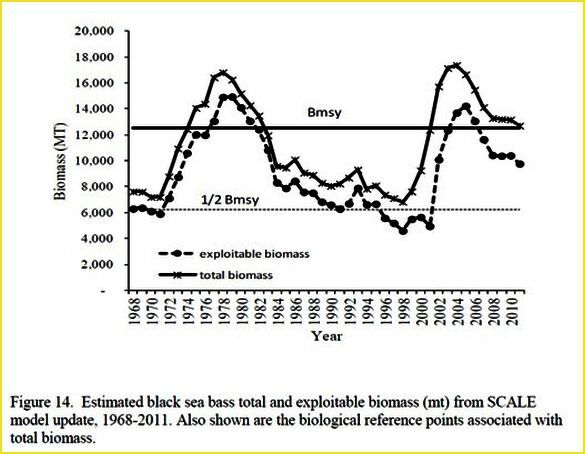 10) 2012 — Overages in the Private Boat estimates threaten to close sea bass for all of 2014. The worst two catch estimate sets in 2012 were in New Jersey & Massachusetts. Massachusetts' May/June, 2012, spike represents how half of the recreational quota can be made to suffer a regulatory seizure owing only to a single spike in the estimates. Massachusetts' 2012 estimates were a huge component in the Accountability Measures struggle. 11) Owing to foresight by an ASMFC Commission member, the winter period from Jan 1st to Feb 29th, 2013 is reopened & the October Closure is reduced to 2 weeks. May, however, is still nearly lost to southern Mid-Atlantic sea bass fishers. A year-long 2014 closure is defeated owing to an incredible effort on the part of management. Recreational sea bass fishers in the lower Mid-Atlantic may yet lose 15 more days of season & 5 fish off their bag limit in 2014 because NY Private Boats are estimated to have caught more sea bass in two late-summer months of 2013 than the entire Atlantic Coast's recreational for-hire fleet caught ALL YEAR! New York's Private Boats are said to have made their all-time record high catch when New York's own party/charter For-Hire operators were; owing to Hurricane Sandy's destruction, factually having their second-worst summer of sea bass fishing in a decade. While New Jersey also has a spike, this one New York estimate is why we're accused of being over-quota; This estimate is why our season's under pressure again. Last Set Key; this table has been modified so New York For-Hire & Private Boat can be compared. Note spikes & percentage inconsistency, especially for 2013.The 2013 New York, summer, Private Boat estimate represented here is Greater Than All For-Hire Catch, Along The Entire Coast, All Year. Readers Should Also Be Made Aware That The 2013 NY Private Boat Estimate Is Based Upon Finding Thirty-Three Sea Bass In Intercept Sampling. Not 3,300 – or 33,000 - Just 33..
was recently advised there was an error on the website where this information was gathered; that the true number of sea bass was more than 100% higher at 78 individual sea bass.. Whether 33 or 78, how so few fish become 240,000 & then half-a-million pounds is beyond my comprehension. Last set again key; this table has been modified so New Jersey For-Hire & Private Boat can be compared. Here you should note carefully the Private Boat see-saw starting in 2005, but especially the percentage value in 2013. Below you can see from a broader, multi-state perspective, how the gap has grown between For-Hire & Private Boat. These two tables show how after Hurricane Sandy sea bass fishing was tough for professionals – yet MRIP has the private boat guys filling their freezers to bursting. Below is representative of pre/mid 2000s percentages. Note For-Hire & Private Boat Percentages In Last Column – An Amazing Switch. Professionals Do Not Believe Private Boats Catch Above 50% Of Coastal Sea Bass. This MRIP table starts in 2001 - should have 13 years. Where the year is omitted the estimate is zero. New Jersey Shore Tautog, Wave 2, Just March/April – Just Tautog Caught From Shore Along New Jersey. That's why Congress created the very unpopular salt-water fishing license law. I supported the fishing license because I can plainly see how it could tighten up our catch estimates. These estimates are a mess. A hundred thousand more fish added to the dumbest estimate ever.. Estimates that make no sense to industry at all..
- by using For-Hire "Vessel Trip Reports" (VTRs are catch reports filled out daily) to double check For-Hire estimates. Then, with as firm a number as possible from the For-Hire side, do a "Percentage of the Fishery" comparison to look for red-flags in the estimate fields. Fish Do Not Fall From The Sky. We must learn how to make fish. Surplus-production is the true backbone of fishery management. It begins with fertilized eggs – more fertilized eggs. Guided Skillfully By Management, Fishing Pressure CREATES Surplus Production. Sadly, right now management's enveloped in an enormous smoke-screen of bad estimates. I believe history will recognize this period as precisely how NOT to manage a fishery. Thankfully, however, we've already witnessed surplus production..now to do it on purpose. Note 1998 to 2004 in the graph below by Dr. Gary Shepherd. Churchill: "However beautiful the strategy, you should occasionally look at the results." When management has discovered habitat & begun to manage fishery production, when we've unbuckled them from the ludicrous; Then we'll enter a period of boundless increase. I just hope I can hold on to my boat until then.